Meet Alex Blagg, the founder of A Bajillion Hits (ABH). Part Internet meme, part satire, ABH is one giant riff on the oft-exaggerated “expertise” of social media “gurus.” Blagg, as his site boasts, specializes in “meme-making,” “Bieber-baiting,” and “Engaging Engagement.” He’s a “visionary,” a “Webeneur,” and “strategenius.” He offers services in “idea design,” “algorithms,” “nano-solutions,” and “paradigm-adjustment.” In other words, Blagg’s parody reminds us just how ridiculous it is for anyone to have an “expertise” in making things go viral. To Blagg, it’s all boilerplate. “A Bajillion Hits is a boutique viral-social strategy and marketing consulting firm specializing in expert opinion on next-gen strategy,” his site advertises, in Blagg’s typical nonsensical, buzz-wordy language. We recently spoke with the ABH founder for our Influence Project. Fast Company: Where did the idea of A Bajillion Hits come from? Alex Blagg: I’ve been lucky to enjoy a number of pieces of content that have gone viral. I really like the physical sensation of getting all those hits, and I think I learned a few things along the way. I wanted to consolidate all that knowledge into one place dedicated to getting hits for myself and for other people. Having such diverse experiences across blogs, and Tumblr, and Twitter, and Foursquare, I wanted to give a repository for all of the knowledge and expertise I’ve managed to put together. 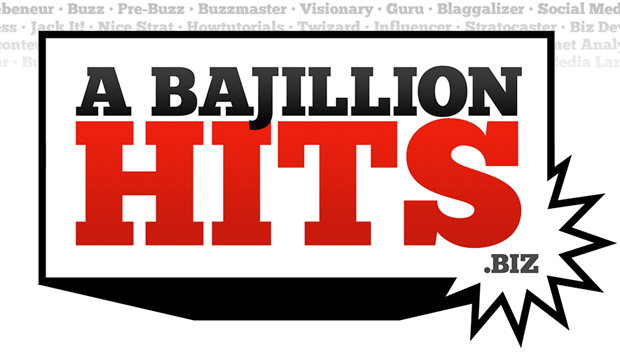 Is A Bajillion Hits more than than an Internet meme? I’ve got six-plus years of verifiable social media experience. I’m keeping my options. If people are into my strat, I’m not going to turn money down. You capture many of the industry buzz words. Social media “gurus” trying to convince companies to use their so-called expertise. There’s countless snake-oil salesmen and social media charlatans out there that are offering their kind-of expert services to companies for a lot of money. This market for digital strategy is high-stakes. I think what it comes down to is that nobody really knows anything, and you have companies and start-ups that are just desperate for some kind of answer or security for a digital strategy that is going to work for their business. People have managed to make careers out of this–there’s a whole cottage industry of people who just claim to be an “expert” or a “guru” or a “ninja” or a “rocket scientist” or whatever words they choose to use. I saw that landscape being very crowded and felt like they needed the ultimate social media expert. I have studied it and lived it! I mean, I have well over 6,000 Twitter followers. My content over the years has received millions of hits. I felt like I could really emerge as…the best. Given that you are the best, could you explain how things go viral? First of all, you have to identify the influencers, be it blogs or media sites or people on Twitter. You have to get your content in front of the people who are going to be able to blast it out to their network so it can resonate across the Web and get really sticky. Whether it’s a piece of content for your business or personal brand, you have to know how to launch it by putting in front of the right people. Step two: You have to have killer content. You can’t just put any kind of garbage out there and expect the Internet to engage with it. You have to create content that is high-impact, that’s going to leverage engagement, and is going to get people excited about sharing it themselves. Because that’s the game changer: When people can get excited to share it. At Fast Company, we’ve been searching for the most influential person online. Besides you, of course, who are some examples of influencers online? The biggest influencer other than me is my mentor and master Gary Vaynerchuck. He’s really done an incredible job of building a solid social media foundation from which he’s able to broadcast his brand. The Scobleizer is another obvious choice. Are there any brands or companies using social media really well? Old Spice, perhaps? Old Spice is great. What was killer about that strat was they really engaged the user on an individual basis by giving those customized YouTube messages. They did a good job mixing in messages to influencers, but then they also picked out the average Joe too. It gave the whole thing an intimacy and legitimacy that really jacked the strat. I was really inspired by that. I’m working with my video team to do a series of videos where I’ll also be responding to people on the Internet shirtless in my shower. The last piece of the puzzle is whether social media actually has a benefit for companies. Why is it beneficial for companies to use Facebook and Twitter? We have to re-evaulate the paradigm of what defines success. Historically, we’ve always looked at profits and revenues, but what I’m proposing is that we shift the paradigm to look at engagement metrics: Twitter followers, retweets, Tumblr mentions. Those things can often provide more long-term value than something as simple as ROI. There’s a lot of different ways to parse the word profitability.